Archadeck of West County in St. Louis Welcomes Dave and Darlene! We’re excited to announce that Archadeck of West County is now owned and operated by Dave Boyer and Darlene Gieseking. In keeping with the Archadeck* brand, Dave and Darlene will continue to design and build decks, screened porches, pergolas, gazebos and other outdoor spaces for St. Louis homeowners. Since both are experts in the metal fabrication and fencing business, residential fencing services will soon be offered too. But regardless of product niche, you can still expect a commitment to great service and outstanding craftsmanship from the team in St. Louis. Everyone at Archadeck of West County thanks the St. Louis community for your support over the years and best wishes to Dave and Darlene now and in the future. Qualified Remodeler and Remodeler Magazine consistently rank Archadeck at the top of their respective annual ‘Best’ lists. Archadeck projects have graced the covers of Gardens, Decks and Patios and Decks and Backyard Projects. The company has been featured by This Old House, Smart Money, Coastal Living, Better Homes and Gardens and Gardening and Deck Design as well as on HGTV. Additional information can be viewed at archadeck.com. Can I Use More Than One Type of Building Material For My Deck? Yes. Yes. Yes you can! And oftentimes you should! As the demand for outdoor living spaces increases, so do the options for design and decor. And it’s easier-than-ever for homeowners to switch-things-up when it comes to customized deck design and building materials. For example, a natural wood or a low maintenance deck is often combined with wooden, vinyl, glass or metal rails… or a combination thereof! Maybe you prefer to subtly match product and color, or instead, you could choose a look with a very stark color contrast. With the right guidance and planning, your outdoor space will perfectly suit your individual style and the character of your home — inside and out! But the proof-is-in-the-project… so take a look at finished designs by Archadeck. Then ask yourself, “Which ones do I really like?” And, simple as that, you have a starting point! Apparently, this has become THE blog-post month for free and easy-to-use resources from Archadeck! From an essential deck safety checklist and video, free downloads of Archadeck’s Design Guide and ‘Loving Outdoor Living’ magazine as well as links to our updated photo galleries of real-life projects, Archadeck brings genuinely helpful ideas and advice to you. Review it right now or pin it for later, whichever you prefer! But if you have questions, please give us a call, anytime. In St. Louis, Missouri call Archadeck of West County at 636-227-0800. Elsewhere just call, toll free, 888-687-3325. 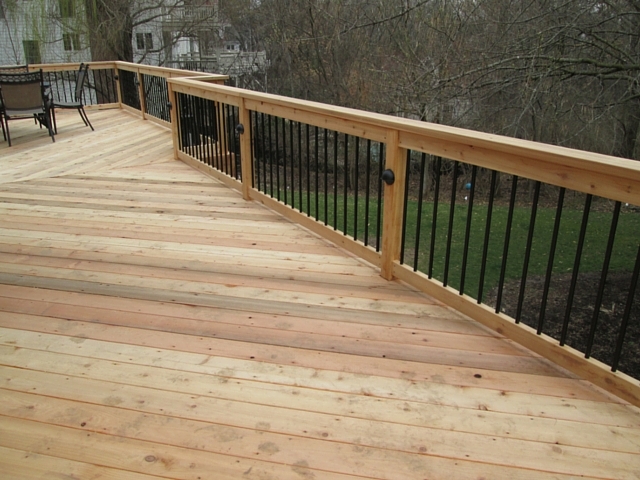 Do you live in the St. Louis, Missouri area and are you thinking about adding or replacing a deck? If so, head on over to our updated website deck gallery to see hundreds of trending, real-life projects by Archadeck of West County for St. Louis homeowners. 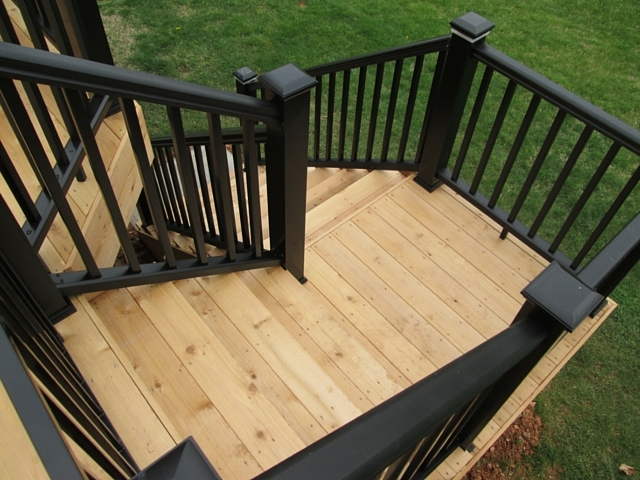 When it comes to decking products, you’ll see plenty of choices whether you prefer wood or composite materials. You’ll see large and small designs, high-elevation decks and low-to-the-ground structures, decks with a single tier or those with multiple levels, as well as traditional and contemporary styles and everything in-between too. And while you’re there, be sure to download Archadeck’s free (and oh-so-handy!) online design guide. But if you’re done looking at pictures and are ready to talk with a local* contractor, just give us a call 636-227-0800. We offer a free design consultation and professional drawings so you can see, first-hand, what your project will look like. *Outside of the St. Louis area, visit archadeck.com or call 888-687-3325. A carefree evening with friends and family can be ruined in a moment by a deck failure and sudden injury. So learn how to inspect your deck with a video and seven-point check-list to ensure your outdoor space is fit for entertaining this holiday weekend. And go here for Archadeck’s Deck Safety Tip Sheet too! Happy 4th of July from Archadeck! Looking for the latest in news about outdoor living in 2016? Loving Outdoor Living* is a beautiful 48 page online magazine that’s free for you to enjoy. Topics include grilling, gardening, pest control, outdoor lighting, and of course, outdoor spaces. Go ahead, take a look by clicking on the photo below. *Loving Outdoor Living is an outdoor lifestyle publication from the fine franchises at Outdoor Living Brands. To contact Archadeck Outdoor Living or any of the Outdoor Living Brands franchises, simply dial toll-free 888-687-3325 or visit archadeck.com.